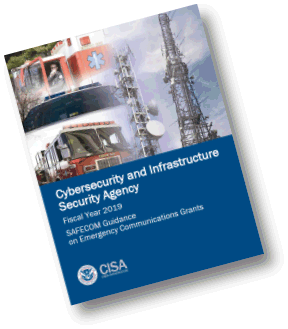 On behalf of the Cybersecurity and Infrastructure Security Agency (CISA), I am releasing the FY 2019 SAFECOM Guidance on Emergency Communications Grants (SAFECOM Guidance), which has been posted to the SAFECOM website at: https://www.dhs.gov/safecom/funding. SAFECOM Guidance is updated annually to provide relevant information on policies, eligible costs, technical standards, and best practices for state, territorial, tribal, and local grant recipients investing federal funds in emergency communications projects. While only entities funding emergency communications projects with DHS/FEMA grant funding are required to comply with SAFECOM Guidance (see Appendix D), all entities are highly encouraged to follow the recommendations within this document to ensure interoperable, resilient, and fully effective communications. In its thirteenth edition, SAFECOM Guidance continues to evolve to meet the needs of the public safety community. This year's Guidance reflects the current emergency communications landscape, investment priorities, technical standards that help to ensure interoperability, and available supporting materials for implementing emergency communications grants. Key changes to the Guidance include restructuring Appendix B – Technology and Equipment Standards for an easier format with comprehensive system lifecycle planning and cybersecurity guidelines upfront, and detailed technical standards and resources for various public safety systems. For questions or additional information on the FY 2019 SAFECOM Guidance, please email: oecgrants@hq.dhs.gov.